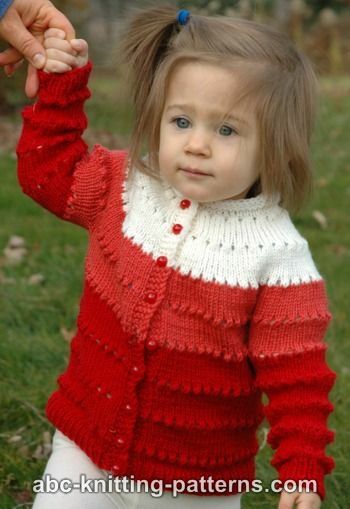 This cute children's cardigan is knitted seamlessly from the top down, back and forth. 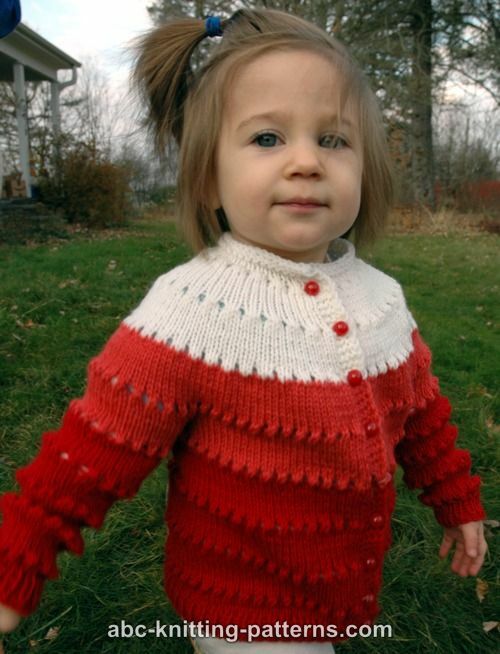 There are rounds of eyelets starting from the neck to the bottom of the cardigan. Circular yoke increases are made in the eyelet rows. 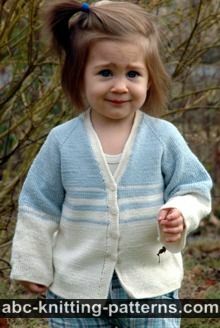 Although you can knit this cardigan in one yarn, it was designed from the beginning with color transitions in mind. It is very easy and convenient to change colors at the end of every eyelet round. I started with white and transitioned to bright red. However, the choice and placement of color bands is up to you. 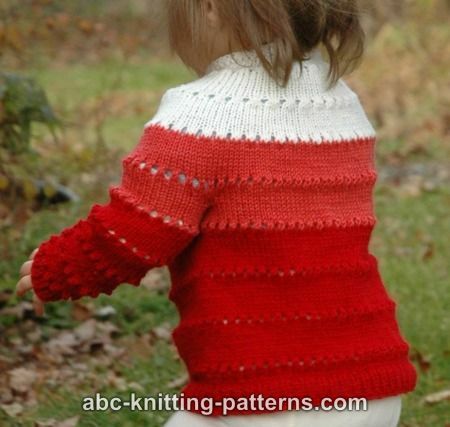 Please note that the color change happens in the wrong side row following the eyelet row. The garter stitch button band is knitted at the same time so that the color changes are seamless. The buttonholes in the button band line up with the eyelets for symmetry. The sleeves are worked in the round on dpn or 16” circular needles. For sleeves you can also use circular US 5 needles if you prefer "magic loop" method. The 1st and last stitches of the pattern are selvedge stitches. Selvedge stitches are used to make the edges of the work even and smooth. 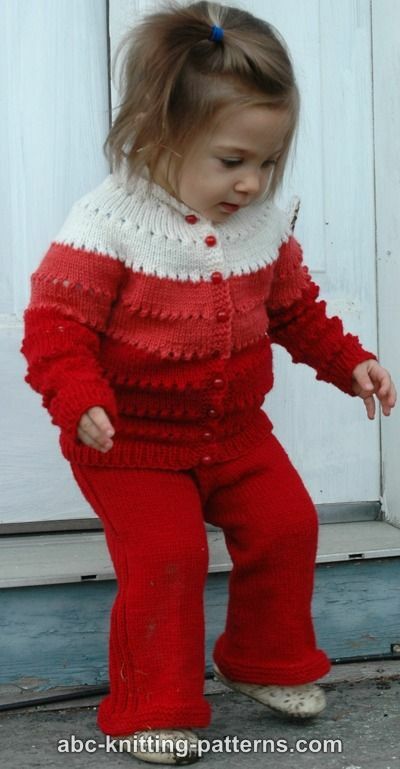 In this pattern, I slip the first stitch as if to knit and purl the last stitch. Button holes are worked on the button band in every eyelet row in the following way: k1, yo, k2tog, p1. 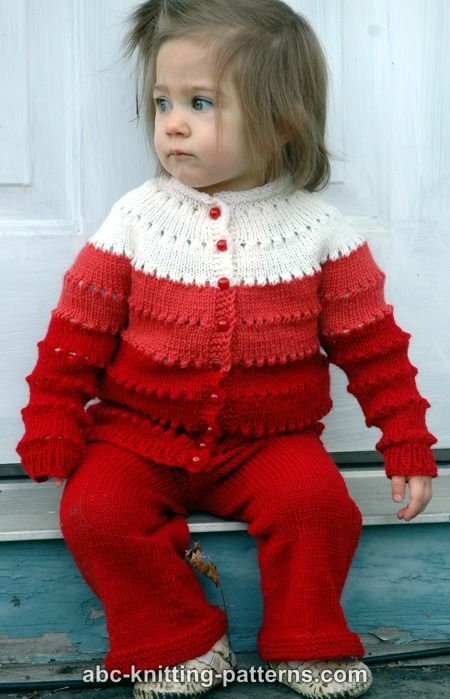 Please note that there is a different number of stockinette st rows between eyelet rows for each size: 10 (12, 14). 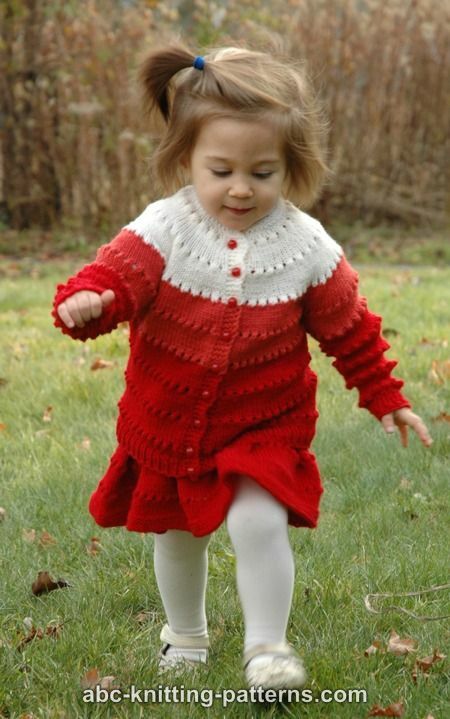 The cardigan is worked top-down, seamlessly, back and forth on circular needles from the center front. With CC1, cast on 56 (58, 62) sts (including 2 selvedge and 6 button band sts). Rows 1-3: sl1 (selvedge), k3 (button band), knit to last 4 sts, k 3 (button band), p 1 (selvedge). Rows 4-6: sl1 (selvedge), k 3 (button band), work in stockinette until the last 4 sts, k3 (button band), p1 (selvedge). Next row: sl 1 (selvedge), k3 (button band), purl to last 4 sts, k 3 (button band), p 1 (selvedge). Work 10 (12, 14) rows as rows 5-6. Next row: sl1 (selvedge), k3 (button band), purl to last 4 sts, k 3 (button band), p 1 (selvedge). sl1 (selvedge), k3, k 1, *k2tog, yo, k 1 - repeat from * 52 (54, 59) times, k 1 (1, 0), k 1, yo, k2tog, p1. Next Row: change to MC, sl 1 (selvedge), k3 (button band), purl to last 4 sts, k 3 (button band), p 1 (selvedge). Work 2 rows as rows 5-6. Next Row: sl1 (selvedge), k 28 (30, 32), transfer the next 29 (29, 31) sts to a length of waste yarn, co 4 sts, k 50 (52, 58), transfer the next 29 (29, 31) sts to a length of waste yarn, co 4 sts , k 28 (30, 32), p 1. = 116 (122, 131) sts. Next row: sl1 (selvedge), k 3 (button band), purl to last 4 sts, k 3 (button band), p 1 (selvedge). Work 6 (8, 10) rows as rows 5-6.
sl1 (selvedge), k3, *k2tog, yo, k 1 - repeat from * 36 (38, 41) times, k 0 (0, 1), k 1, yo, k2tog, p1. Repeat 5th eyelet row, next even row and following 10 (12, 14) rows 3 more times. In the last repeat work only 4 rows instead of 10 (12, 14). Work 1x1 rib for 10 rows. Bind off. Transfer sts from a waste yarn to dpn (or circular needle), distribute the stitches evenly. Pick up and knit 4 sts underarm. Mark the beginning of the round. Work total 68 (84, 92) rows or to desired length, taking into consideration that there will be a 1” (3 cm) band of 1x1 rib at the bottom of the cardigan. Work the eyelet rows in the sleeve the same way they are worked in the body of the cardigan starting from the next row after the division to body and sleeve. 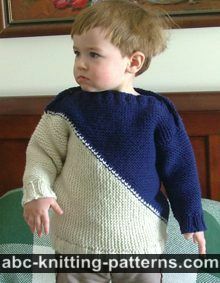 All the even rounds are knit instead of purled, since the stockinette st in rounds is all rounds knit. Work eyelet rows every 10 (12, 14) rows, same as the body. 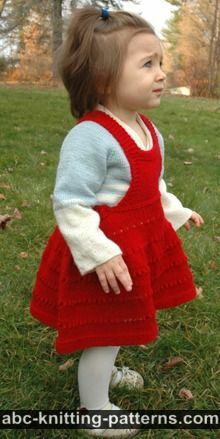 Alternatively, you can work the sleeve in stockinette stitch, without eyelet rows. Work 10 rounds of rib 1x1. Bind off. Weave in the ends of the yarn. Block the piece. Sew on buttons. December 9, 2017: pattern updated. There are 7 total comments on this article. When you say work in stockinette stitch to last 4 stitches do you mean K1 P1? On row 7, the first eyelet row, it says I should do repeat the yo, K2 25 times. There are not enough stitches and I only get 82. I'm making size 4. Am I missing something? thanks for this very nice cardigan. My problem is row 7. I count 5 stitches for selfedge and button band on each end, this makes 10 stitches. Then 3 x 24 stitches = 72. Altogether I now count 82 stitches. Your pattern says 80. What do I do wrong? I love all your patterns. I have not had any problems with any of them. This is so nice. 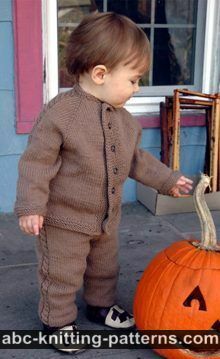 Any chance you might do this in adult sizes including plus sizes? I can see it being a go to pattern for adults and kids.